Is your entryway missing something? It's the first thing you see when you arrive at home, and it's often a depository for keys, mail, bags, shoes, and of course coats. Is it a marvel of modern efficiency, or a stress-inducing clutter haven where everything lands at the end of the day? With a messy, rainy season not far off, an organized entryway can help keep your home cleaner and drier, and a lot more relaxing, too. That's great for you and your family, and it's also a welcoming first impression for guests who follow that path to enter your home. Here are a few of the many ways you can get your entryway in tip-top shape. 1. Identify your unique organization issues. 2. Focus on function first. 3. Spend time with our professional designers for the perfect fit. What are the issues inside your entryway? Do jackets find their way to a closet or hooks, or are they more likely to land in a heap or transfer on into the house? And what about rain boots, umbrellas, and bags? Take a good look at the entry in its current condition. Most homes have certain patterns, such as mail stacking up where it oughtn't and shoes leaving water spots on the floor. For every problem, there's a solution, and your wide-angle view of the area - whether you enter your home through a side door, hallway beside the garage, or back door by the kitchen - will help you spot where your entryway needs a little help. Here's an idea: take a photo of the entry and transfer it to your computer. That really helps put the space and your clutter issues into sharp focus, which is a great first step in identifying your family's patterns and organization needs. Things land in a certain spot for a reason, and a good system lets you work with, not against, your nature while maintaining an organized space. Do you have a favorite friend or relative whose home always looks and feels put together, even it it's not fancy? That's because function is the most important thing about getting organized. Looks take second place, but don't worry - we'll get to that in a moment. Function should be your top priority in designing the perfect entryway. If you don't like the looks of multiple coats in full view, then you need closed storage for your outerwear. If it doesn't bother you and you'd rather have convenience, then a series of hooks might be a better choice. The same applies to backpacks and purses. And what about shoes? Do you mind seeing them in a row against the wall? If so, a shoe bridge under an entryway bench is a perfect, tidy solution. For every element that's in a bit of disarray, there's a way to manage it. And once that's settled, then you can think about making it look great. 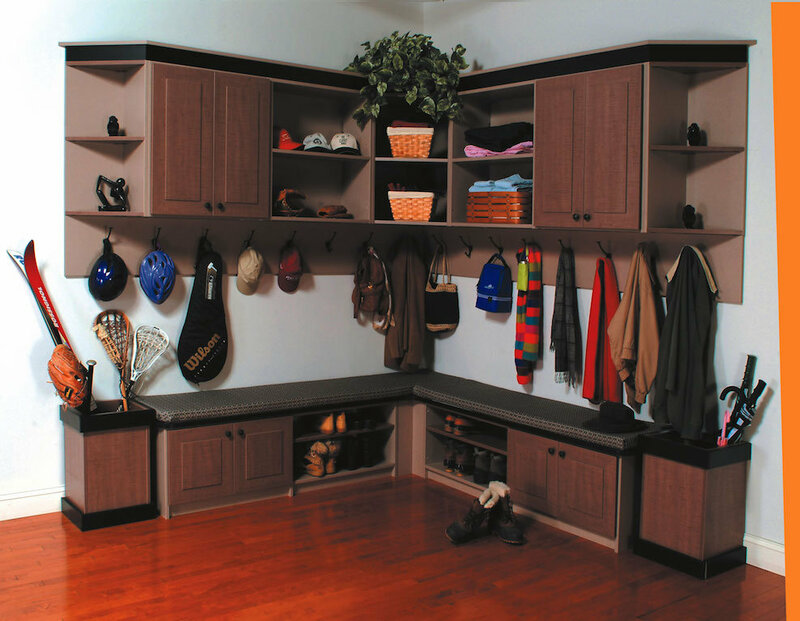 At The Closet Works, we have storage systems that are customizable down to the smallest detail, including wood grain finishes and hardware to complement your home's decor. Just because it's storage doesn't have to mean that it looks utilitarian and plain. You've probably experienced this before. You spot a great looking storage unit, and you set it up at home only to learn that it looks cheap, it wobbles, and it doesn't fit the space at all. You'll probably lose a fastener or two in the process. Now imagine the opposite of that. Beautiful, high-quality storage that's not only sturdy, but fits and suits your home perfectly. Custom design and fabrication are what makes it happen. Your entry has its own dimensions, and they're probably unlike many - if any - other. 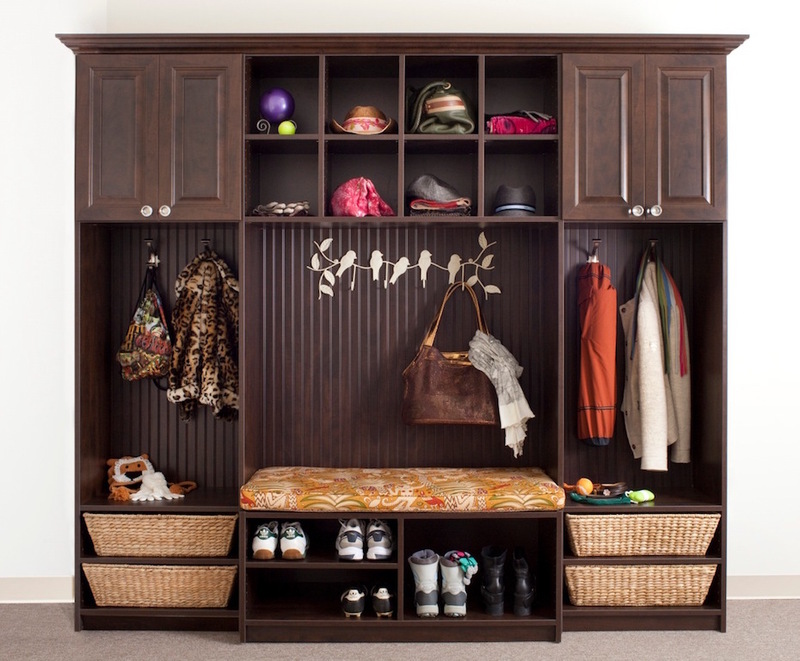 Even in a home without a formal entry, you can create one using the right storage. It doesn't matter if you use the side door, utility room, or back door to enter your home. Maybe you want a bench with cubbies and hooks, but it needs to fit along a slanted staircase wall. You can get that, and our professional designers make it happen. 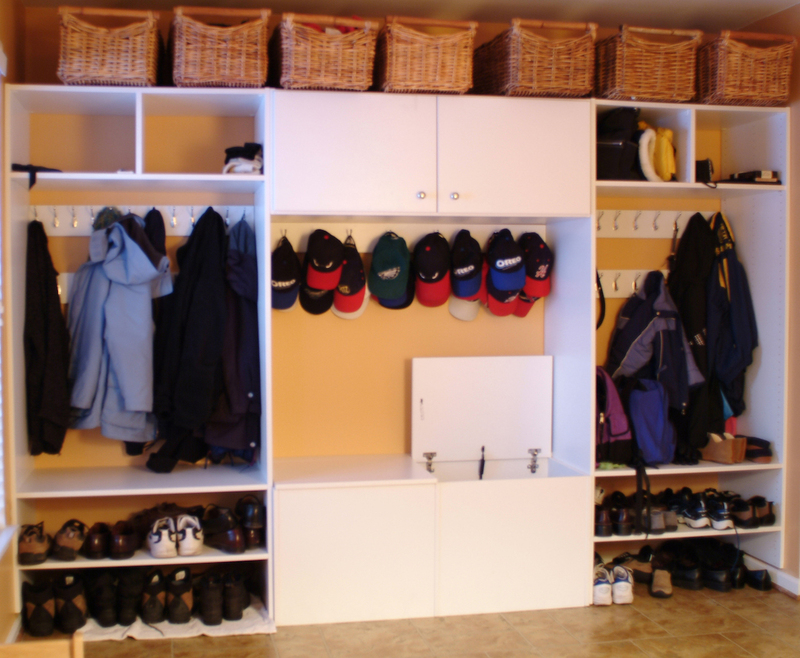 Or maybe you'd like a proper armoire where shoes, umbrellas, hats and coats are tucked away behind doors. You can have that, too. We pride ourselves on offering you exceptional quality and service, at a price that you honestly can't beat. In many cases, we can design and build what you need in the finishes of your choice, and do it affordably. You can outfit your entry with any number of things including attractive, water-wicking utility rugs (a very smart idea recommended by Zillow) and a large mirror for a last look before heading out the door. But for a truly organized space, it all begins with your storage. Contact us today for more information about designing your perfect entryway.